We are excited to present Outee – a furniture module and planter designed by Sam. Outee was initiated to address real needs, in particular the challenges of urban growth. It was designed with micro-scale spaces in mind. The compact design and adaptability of the module provides a spatial solution where floor space is limited. The Furniture Module offers several functions simply by rotating it – a table and chair, a bar stool, a bench or a high table. The Planter can be rotated to provide 2 different pot sizes for a variety of plants and / or stages of maturity. Outee would be ideal for small outdoor spaces such as balconies. It would also sit comfortably in bookshops, breakout spaces, kids bedrooms and the like. Its flexibility would earn it high praise at galleries, resorts, cafes, libraries, universities and schools. The design of Outee was proudly supported through a Creative Sparks Grant, a joint initiative of Brisbane City Council and the Queensland Government through Arts Queensland. The Booksmith Range, as the name would suggest, is made from discarded books. Each item is an original and is hand-crafted using traditional bookbinding skills. The Range responds to social concerns with regard to the environment. Most obviously the products are made from pre-loved books. They are functional and the design is intended to challenge our throw-away society. Each item is made locally in Australia using locally sourced books and traditional bookbinding techniques. The Booksmith Range was developed around Bookscreen to minimise waste (ie so all parts of the book are used). The range includes the Mini Bookscreens (made from the hard back covers), the Siena Bookblock Tables (made from the pages), the Dust Jacket Gift Cards (made from the original Dust Jackets), the Booksmith Swing tags (utilising pages), the Notebooks and the associated notepads (made from various parts of the book). 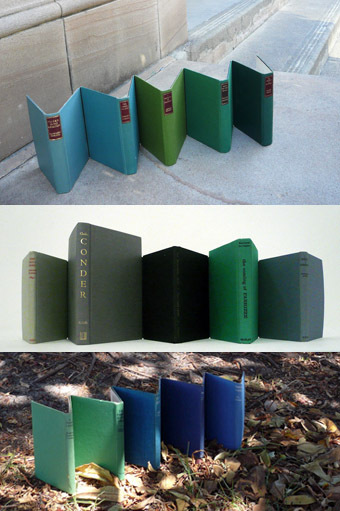 Bookscreen is a flexible screen constructed from quality, used, hardback books. Each one is handmade, individual, an exploration into colour composition and builds on the qualities of the original books. The screens are assembled using traditional book binding techniques. The integrated book spines provide pliable hinges for the concertina screen. Each screen is given a Christian name. mini (5 books. 5 books across and 1 book high). low (18 books. 6 books across and 3 books high. Approximately 550mm). regular (48 books. 6 books across and 8 books high. Approximately 1500mm high). large (64 books. 8 books across and high. Approximately 1500mm high). colours The bold colours of the book covers provide an integral part of Bookscreen. 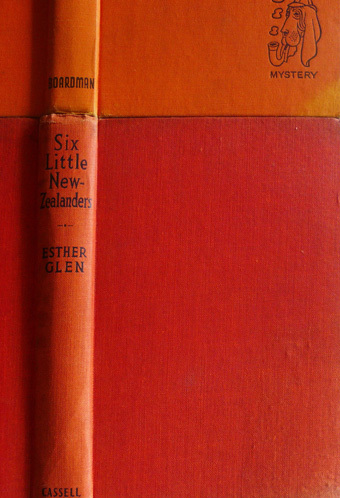 Hard back books can be found in a range of colours and tones and can be arranged in a variety of ways including: a spectrum of colours, a gradation of a range of colours or a more random composition of colours. reverse The back of each screen is lined with pages from the books themselves; providing a subdued alternative for a change of character. application Bookscreen’s bold colours, simplicity and existing patina would add an element of personality to any interior. The taller screens would be an ideal privacy screen for reading, as a feature in corporate foyers, libraries, cafes or for delineating space and providing a haven in an open plan house. The low and mini Bookscreen would provide an ideal privacy screen above or below a workstation. Over time as traditional books are increasingly replaced by digital media the Bookscreens will provide cultural reminders for future generations on the tactile nature and beauty of handcrafted, traditional books. Like the taller Bookscreen, the Mini Bookscreen is constructed from quality, used, hardback books. Each one is handmade using traditional book binding techniques and is given a Christian name. size typically 5 books across and 1 book high. application the Mini Bookscreen would provide an ideal privacy screen above or below a workstation or provide an intriguing table centrepiece. Siena is made from the pages of discarded books. The original bookblock (ie the block of pages) provides the backbone to the table. No glue is required during Siena’s construction. Each item is an original and is hand-crafted by Sam herself. The resulting forms are surprisingly sturdy. sizes Siena is available in three typical sizes: Tall Siena the Bookblock Table (310 to 395mm high), Standard Siena (210 to 305mm high) and Mini Siena (less than 210mm high). themes The possible themes are endless. Some popular themes in the past have included: cooking, gardening, Australia, travel, the world, the universe, artworks, photography, butterflies, children’s books or a specific colour. photography Matt Moore (top), Monique Germon (middle) and Sam Parsons (bottom). application The tall and standard Siena’s function as occasional tables, either individually or in clusters. They can be used with or without a tray / plate / glass / book sitting on top (whatever you have at home). Alternatively Siena makes for an interesting sculptural feature sitting on a table, mantle or shelf. They provide a great talking point as a table centre piece at a dinner party or function. These hand-made blank giftcards are hand made using the original dust jackets left over from the construction of Bookscreens. Each card is an original. An Australian designed and produced, limited edition range of wall plates created in collaboration between Cindy-Lee Davis of Lightly and Sam Parsons of Studio Sam in 2009. The design builds on Studio Sam’s Betty Blue Range. A narrative is created through the application of circular motifs. Family of Sam is the brand name for the diverse range of products designed by Samantha Parsons. Betty is a set of crockery assembled from a mix of mis-matched, ‘as good as new’ plates. The concept was not purely about giving the plates a make-over. The intention was to go a step further and address possible reasons the plates were discarded in the first place; in particular the issue of good quality plates becoming orphaned. Betty gives these plates a new family. Although each plates is an original composition (no two plates are the same) and each comes from a different walk of life, they are now related to one another through the application of blue and white circular motifs. The artwork is based on several of the found plates, which themselves form part of the new set. Floorscape is an interactive rug that can be easily folded, configured and reconfigured into freestanding structures. It has an integrated structure and a series of fold lines for simple, on the spot assembly without any separate, fiddly pieces.